Mercer Caverns is the longest continually operating commercial caverns in the state of California (with a guestbook dating back to September of 1885 with many notable guests including royalty and a US President). The three million year old cave has been equipped with modern stairs, walkways and lighting. The updates were made with great care to ensure the the living limestone caverns are presented in their original beauty. 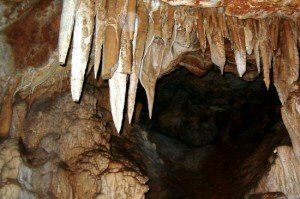 Interesting fact: the cave was originally used by a prehistoric tribe – the Yokuts – as a place for the dead. As the Yokuts were hunters, they migrated with the game and soon left the area. With time, the cave entrance filled with soil, rock and other debris and was left uncovered until its discovery in 1885.